The Cinque Terre is a necklace of five tiny fishing villages strung along the southern end of the Italian Riviera. It is a place to kick back and relax, to take a break from Italy's cultural treadmill of art-stuffed museums, frescoed churches, and ancient ruins and just sit back and let la dolce vita wash over you. Hike from one town to the next along ancient goat-herd paths clinging to the cliffs above the deep blue waters as you wind through terraced vineyards and macchia scrubland. When you're done your amble, splash in the waters of the Mediterranean. Sunbathe on a pebble beach. Sip a glass of wine at a cafe table overlooking a tiny harbor bobbing with colorful fishing boats. Savor a four-hour dinner surrounded by the stone walls of a family-run trattoria. Or just sit on a bench watching shafts of sunlight slip through the gaps between the tall, faded pastel houses riding higgedly-piggedly up the hillside and observe the bees pause from muzzling the reddish-purple flowers gilding the mounds of bougainvillea spilling over the walls to come sun themselves in the sunbeams, hovering like tiny fuzzy yellow helicopters. Ahh. At the southern tip of Liguria, south of the Italian Riviera proper and just a short, two– to thee-hour train ride from Florence, lies this string of five colorful fishing villages known as the "Five Lands," or Le Cinque Terre. From south to north they are Riomaggiore, Manarola, Corniglia, Vernazza, and Monterosso al Mare, and they are as yet only moderately touched by tourism. (Except June through August, when they are packed with Rick Steves' fans—Damn you, Rick!). Sadly, flash floods on October 25, 2011, gravely damaged the region, devastating Monterosso and Vernazza in particular. It also washed out sections of the popular hiking trail linking the villages—though officials expect to have the main path fully reopened by Easter, 2013. The residents there are digging out from the mud and rebuilding, but it may be a while until the towns are back to their old selves (Vernazza's main street was filled with 13 feet of mud and debris). As of spring 2012, Vernazza has just begun to get back on its feet (several businesses have, indeed, already reopened), and in Monterosso only the newer part of town is open. Keep track of their progress at www.savevernazza.com and www.rebuildmonterosso.com. Despite my ribbing of Rick Steves up above, he is rallying to the cause of the region he helped put on the tourism map, and you can find regular flood recovery updates (as well as links to local aid orignizations) in the "News" section of his site: www.ricksteves.com. Best thing you can do: come and visit regardless. Most of the rest of the Cinque Terre is back up and running, and they really do need the support (and, frankly, your tourism dollars). The path from Vernazza into Corniglia. (Photo by Barbara Ann Weibel. )The Cinque Terre offers you a chance to take a vacation from your vacation, to slow down and enjoy the simple charms of splashing into the Mediterranean off a pebbly beach, or sipping sweet sciacchetrà wine at a cafe table on a vest-pocket piazza. More importantly, the villages of the Cinque Terre are linked by a series of ancient goat paths, and hiking from one town to the next along those trails is the Cinque Terre's biggest draw. The Cinque Terre park authority (tel. +39-0187-76-031 or 0187-762-600 or 0187-762-640; www.parconazionale5terre.it) has offices in Riomaggiore at Piazza Rio Finale 26 and at the train station in Manarola. Also, get in one of the first two or three cars of the train, since several of the stations in the Cinque Terre are very short (basically just an open stretch of tracks between one tunnel and the next) and back end of the train is sometimes left inside the tunnels. I'm going to use Riomaggiore as our Cinque Terre base and give you train times to there; add 2–12 minutes to estimate the time it'll take to get to any of the other towns. Riomaggiore is pretty close to Pisa (75–95 min. total), Lucca (1:30–2 hr., with another change at Viareggio), Florence (2:15–3:33 hr., sometimes with another change at Pisa), and Rome (4:17–5:38 hr.). You can do the hike between the villages in five or six hours if you really hoof it, but most people take two days and make it more of a leisurely stroll, stopping for long lunches, pausing at cafes, taking a few hours to splash in the surf off a pebbly beach, and enjoying a nice long dinner before returning to a hotel or apartment with a view of the moonlight reflecting off the Mediterranean Sea. They now have the temerity to charge you to hike the old goat paths between the villages. This ticket is called the Cinque Terre Card, and you can get one valid for 1 day (€5), 2 days (€8), 3 days (€10), or 7 days (€20). It includes admission to the trails, use of the (frankly superfluous) tiny buses in some towns, the occasional elevator, and entry to a few tiny museums (local history in Riomaggiore, wine in Manarola, and in Monterosso an aquarium and a museum of anchovy salting—no, seriously). 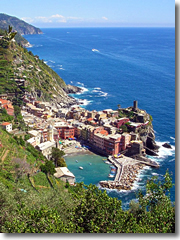 There are also versions of the Cinque Terre Card that include unlimited train rides or unlimited ferry rides. Unless you're planning to take more than two train rides during your visit, don't bother. A standard train ticket between any of the towns costs just €1.60 to €1.80, while the train version of the card costs roughly €3.50 to €16.50 more per day (meaning you'd have to ride the rails at least three times a day or more to make it worthwhile). And, while nifty, you're unlikely to ride the less-frequent ferry more than once as a sort of mini-cruise. 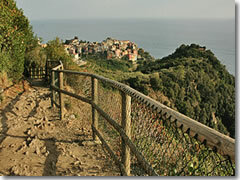 www.cinqueterre.com - Some good alternative lodging options, plus a blog; not all available in English. www.cinqueterrevirtuali.com - 360-degree photographs providing panoramic virtual tours tours of the towns, trails, restaurants, and many hotels. Food: At dinner, indulge a fresh fish dinner and the two greatest Ligurian contributions to world cuisine: pesto sauce (pine nuts, basil, and olive oil hand-ground together in a mortar and pestle—hence the name—and served over hand-twisted pasts called trofie), and focaccia, the original Italian flatbread (and progenitor to pizza). Drink: Shack up at a cafe on a vest-pocket piazza in one of the towns and sip the Cinque Terre's famous sweet sciacchetrà wine. If you're not a fan of dessert wines, you can always try the Cinque Terre DOC, a semi-dry white wine produced by the area's wine cooperative. Pisa (75–95 min. by train via La Spezia), Lucca (90–115 min. by train via Viareggio and La Spezia), Florence (2:15–3:33 hr. by train via La Spezia or Sarzana).